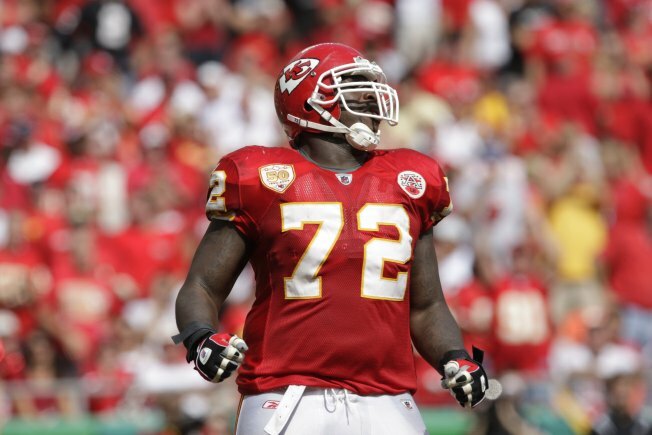 When Glenn Dorsey came out of LSU as the fifth overall choice by the Kansas City Chiefs in the 2008 NFL draft, he was viewed as certain success. Now, as he starts on Phase 2 of his pro career in San Francisco, the 49ers see him not as a superstar but as a versatile defensive lineman who can be plugged into a number of positions. When Niners GM Trent Baalke spoke with Bay Area reporters this week on a number of topics – the team’s moves in free agency and the upcoming draft, in particular – he emphasized Dorsey’s ability to play all along the defensive line. And, with the departure of nose tackle Isaac Sopoaga and defensive line backup Ricky Jean Francois, he’ll get plenty of opportunities to show the rest of the NFL that he can still be a solid player. “The good thing about him is his versatility. He can multi-align in our system,” Baalke said in a press conference. Though it’s been surmised Dorsey’s primary playing time may come at nose tackle, Baalke said Dorsey’s ability to play defensive end – particularly in a backup role to Justin Smith – and defensive tackle in a 4-3 scheme gives defensive coordinator Vic Fangio options to put Dorsey in spots where he can make a difference. Because Dorsey didn’t make the impact in Kansas City that many believed he would, the thinking has been that his talents are best suited to defensive tackle in a 4-3 scheme rather than as a nose tackle in a 3-4, which is what he was playing most of the time for the Chiefs. In five seasons in Kansas City, he averaged nearly 32 tackles per season and had just four sacks – numbers far short of what might be expected from a player at LSU who was a consensus All-American and winner of the Outland Trophy as college football’s best lineman. After signing a two-year deal with San Francisco in March, Dorsey told the San Francisco Chronicle he’s eager to play anywhere the coaching staff needs him. It’s possible, too, that the 49ers will add additional defensive line help in the draft, which might further clarify Dorsey’s role. If he thrives in the Niners’ system, Dorsey also might be in line to eventually replace Smith at right defensive end. Smith, 34, has just one year left on his contract. In a recent post on his NFC West blog, ESPN.com’s Mike Sando suggested Dorsey might be much better with a change of scenery and a chance to work with defensive line coach Jim Tomsula. Sando notes that both 49ers defensive ends, Smith and Ray McDonald have “flourished” under Tomsula in the 3-4 scheme, and that the Niners are likely to use a system in 2013 that utilizes more depth and versatility. Though the base defense is 3-4, it varies widely throughout the course of a game. For his part, Dorsey is happy to be going from a foundering Chiefs franchise to one that’s coming off a Super Bowl appearance.